Have you noticed that by changing one detail; one event, one character trait, one thought…you can completely alter the rest of the story? It was Catherine… what on earth was she doing here? She was barely alive! Bluebeard returned from his travels. They sat down to feast. An eerie sound echoed through the ground floor corridor. Bluebeard rushed to the armoury. There upon the floor, lay Catherine, wife number six, the most recent victim. Elizabeth lunged at him from behind. Catherine sprang from the floor and delivered a blow to his left cheek with a hammer. They stripped him, gagged him, tied him up, cut off his famous beard and put it into a pouch. They dragged his unconscious body, to place it in the cramped room, alongside the corpses of his former wives, locked the door and disposed of the key. Later, the two women stood in front of the ancient fireplace. "I had to wait for Bluebeard to be called away, so that I could get my hands on the keys," Elizabeth answered. "Well… you came in the nick of time." "Yes, all's well that ends well," Elizabeth smiled as she turned her back and slipped the pouch into her pocket. "The king will be impressed," Elizabeth emptied the powdery contents of the vial into a goblet, and handed it over to Catherine. Yes! I agree wtih Alex! And those are two tough chicks! I love it! Thanks Leigh. 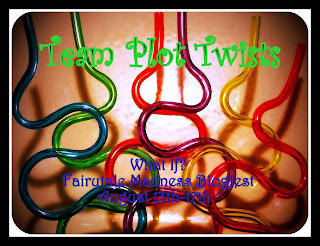 I loved your "NOT so happily ever after" with an ankle 'twist' Cinder story… classic! Eeee! Just desserts and wicked Elizabeth, lol. A delicious twist and fun plot. I got shivers. Well done. Reminds me of "every dog has his day"… Your story was brilliant! It had all the ingredients for a winner – including a moral! Thanks for the visit and comment! Eerie! I love it. Very entertaining and imaginative. Serves him right! Nice job! Yep, it sure does. What goes around, comes around… and all that jazz… thanks! I've heard of Bluebeard, but am not familiar with the story. I'll have to go check it out. I like these ladies! Elizabeth seems unstoppable. Great piece. Thanks Cece. Between Beauty & The Beast, I'm wondering who got to the mayor first! *chuckles* My money is on Beauty! 🙂 I loved your version of the tale! Great stuff. Girl Power all the way! The murderous bully got his just desserts! he!he! That wicked Elizabeth taking everything for herself! lol, great story! I was really caught up in your bittersweet Aladdin & Genie love story… wonderful writing! Thanks J.A. Clever women! I'm glad Bluebeard got what he deserved. Really great piece and Bluebeard got what he deserved! love a smart, devious wench! nice job! I must say that your fun-loving, adventurous ninja piggies are not to be messed with… they were SO adorable! I really enjoyed your tale! Love it when the chicks are bad a**. Well done! Bad a** to the core… he!he! And I loved your smart and savvy Ella! Way to go! Interesting! I love their conspiracy, and that he definitely got what he deserved, lol! Nicely done. Thanks Cortney! The double twist you added to the Sleeping Beauty tale was totally unexpected… really packed a punch at the end! Great job! You've really outdone yourself again Michelle! I always enjoy reading your imaginative stories with a twist! Great twist ending. Elizabeth is more than she first appears! Appearances can be deceptive… 🙂 Thanks G.E. Tough chick that takes care of business! Love that. Great entry. He got his in the end! Your feisty and rebellious Cinderella would go down well with the modern reader. Thanks for the visit and comment, Denise. Fun twist and theme. Nothing worse than a group of women scorned! I like the touch at the end with the vial of polyjuice type potion with Blubeard's beard. I enjoyed your Cinders Fella… and the "three lumpy mattresses" image is etched on my mind! *chuckles* Thanks for the visit. That was awesome. Loved the twist at the end! Your "poisonous porridge" version of Goldilocks was very stylish, Nick! I especially liked the blame-it-on-the-bears feeling that came through in the tale. Echoing everyone else here with a 'Karma's a beast!' Lol. Great job! Yes… what goes around, comes around… thanks Cassie Mae!